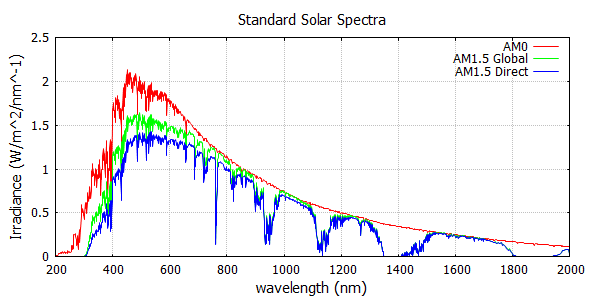 In order to measure the spectral match of a solar simulator, the simulator spectrum is compared to the reference spectrum by measuring the distribution of irradiance as a percentage of the total irradiance across specific wavebands defined by the standard. a single detector with multiple band pass filters. The table below show the wavebands over which the spectrum is measured and the spectral distribution of the standard reference spectra for terrestrial direct (AM1.5D) and global (AM1.5G) as well as extraterrestrial (AM0) conditions. Using the classification definitions from the previous chapter we can see, for example, that in order to achieve a class A rating for spectral match, the percentage irradiance distribution of simulator must be within +/-25% of the reference spectrum for each waveband. Care must be taken when reading graphical representations of a simulator's spectral match. Given that the standards all divide the spectrum into wavebands of 100nm and 200nm width, it is within the standard guidelines to simply display the maximum and minimum deviation bands for the integrated irradiance over any given waveband, as opposed to showing the real, unintegrated spectral output over the waveband in, say, 1-5nm steps. This last point is worth noting as the integrated irradiance can deviate by as much as +/-25% from the referece spectrum, which allows for considerable perturbations in the simulator spectrum over a 100nm waveband whilst still maintaining a class A spectral rating. This should be a concern for applications that require a close spectral match.